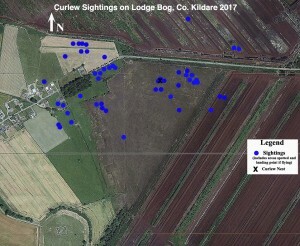 This project, funded by the Heritage Council under the EYCH Community Heritage Grant Scheme 2018 and the Department of Culture, Heritage and the Gaeltacht Curlew Conservation Partnership, aimed to ensure the breeding success of Curlew on Lodge Bog, to understand the behaviour of Curlew and their use of land surrounding the bog and to make lasting connections between the community and Curlew. IPCC worked together with Birdwatch Kildare and local landowners to monitor the behaviour of Curlew on Lodge Bog and to take measures to protect the birds from predators, livestock and agricultural activities. Through hosting events for International Curlew Day, Biodiversity Week and Heritage Week. IPCC built awareness of the plight of the Curlew among the local community and general public. The first record of the Curlew returning to Lodge Bog in 2018 was on the 23rd March. 70 Curlew surveys were undertaken by IPCC between the 24th of March and the 17th of July 2018. The method of survey was the vantage point technique whereby an observer remains at a particular point and records all birds that come into the visible surrounds for a set amount of time, birds heard calling during this time are also recorded. On International Curlew Day Kildare Birdwatch undertook a dusk to dawn survey of the bog and during this survey they recorded a total of five Curlew. The birds were very active throughout April and May and pairs were often seen feeding in agricultural land adjacent to the bog and sometimes showing courtship and nesting behaviour on the bog. After the 30th of May the birds were not seen until the end of June. On the 7th of June Kildare Birdwatch undertook a Curlew nest search on Lodge Bog, unfortunately no nests were located. However, they did find a Curlew egg which appeared to have been predated by a fox. The results of the monitoring efforts suggest that there were 2 pairs of Curlew visiting Lodge Bog. At least one pair attempted to breed but were unsuccessful due to predation. The very hot, dry summer may also have been a factor as Curlew feed on invertebrates in soft, peaty soils. The drought may have had impact on food availability due to the hard dry soil/peat. On June 29th seven Curlew were seen flying over the bog, they flew in from the south and landed down on the southern end of Lodge Bog north. It was unclear if they were adult birds or if some were juveniles. There is a possibility that the birds seen earlier in the season relocated and nested in another area nearby to Lodge Bog and that these were the 5 birds observed in April plus two chicks. Alternatively it is possible that this group may include some early returning migrants (Donaghy, pers comm 22/10/18). Without the birds being tagged it is impossible to say for sure what birds they are and where they came from. 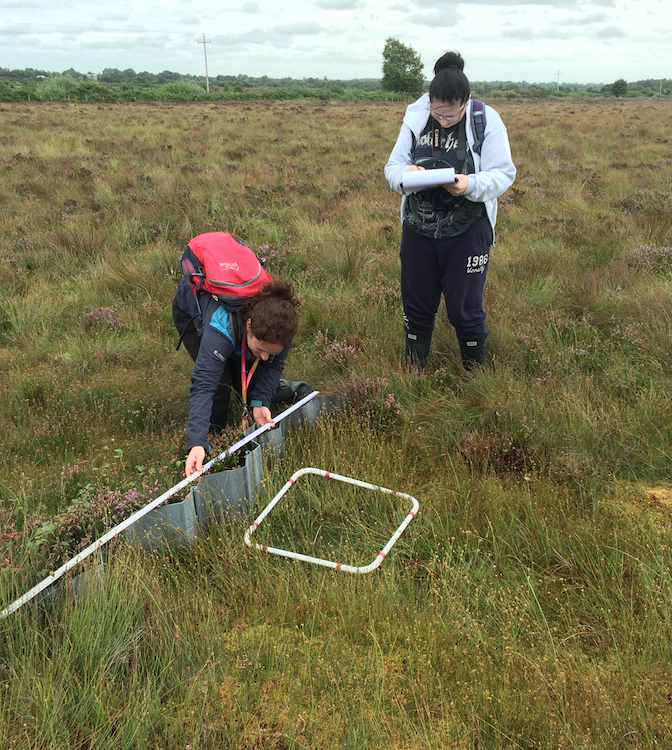 On the 30th of May Dr Catherine O’ Connell and Ms Katie Geraghty undertook a habitat survey of the grassland and cutover bog habitats surrounding Lodge Bog.The following data was used to produce the Curlew Habitat Map (see below): data recorded during the habitat survey, IPCC data on the raised bog habitats on Lodge Bog and habitat data from Bord na Móna. Through intensive monitoring of Curlew behaviour in 2017 it was discovered that livestock (horses and donkeys) from the neighbouring farmland were disturbing the nesting Curlew by coming onto the high bog to browse. 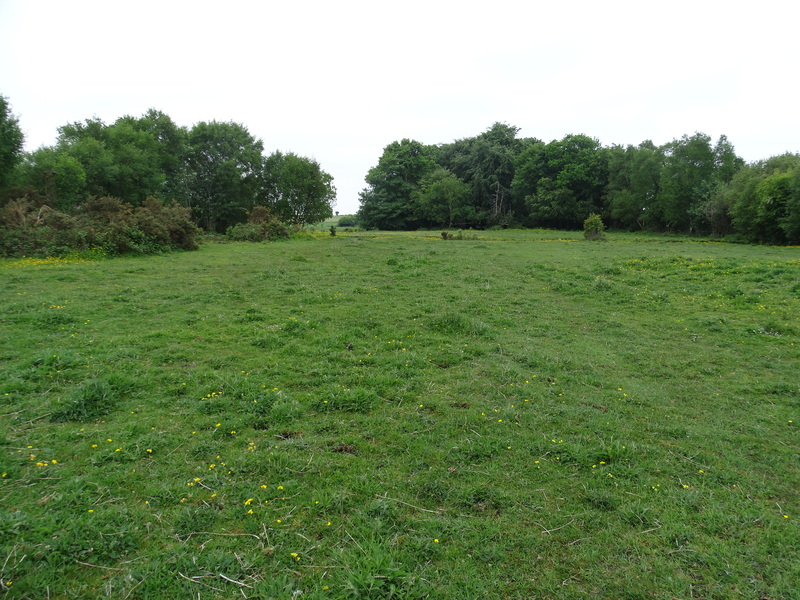 It was also noted that the topping of the adjacent grassland in June was reducing the amount of cover available for newly hatched chicks. This project allowed IPCC to put the following measures in place to reduce these risks. 1. Erecting an electric fence to prevent livestock from entering the bog. 2. Liaising with local farmer – Michael Gorey. IPCC and Kildare Birdwatch approached Mr Gorey and discussed the need for conservation efforts to be put in place to protect the Curlew from extinction in Ireland. Mr Gorey kindly agreed to delay the topping of his field until the 1st of August. The delaying of the topping of Michael Gorey’s field had a positive knock on effect on the butterfly populations in the area. 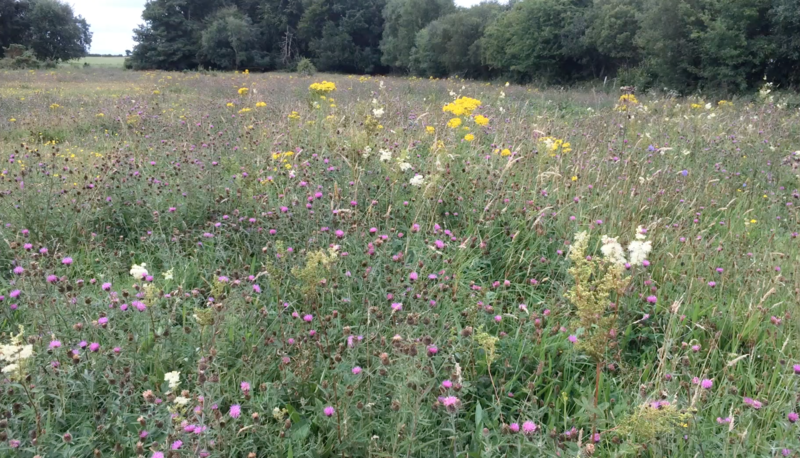 The wild flowers in the field were allowed to bloom providing nectar for many butterfly species including Common Blue, Small Copper, Large White, Painted Lady, Peacock and Meadow Brown. Goreys field in late summer. Wild flowers had the opportunity to flower due to the delaying of topping providing nectar for insects and butterflies. Curlew chicks are flightless for the first 32-38 days after they hatch so are very vulnerable to predation. This makes it almost impossible for the Curlew to rear their young. Avian predators such as Hooded Crow along with foxes are the main predators observed at Lodge Bog. To reduce the threat of predation, humane predator control measures were put in place on Lodge Bog. A crow trap was located on agricultural land to the south west of Lodge Bog north. The type of trap used is known as a ladder trap. 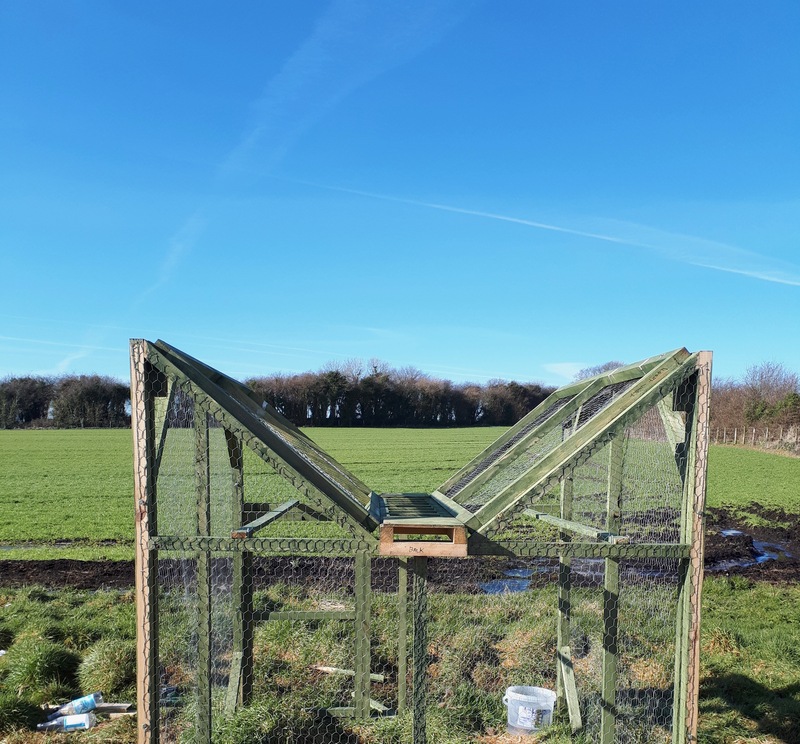 The trap is baited and a bowl of water is added before setting, once the crows enter the trap through the ladder, they are unable to leave again thanks to the slope shape of the trap’s roof and the carefully spaced ladder rungs. The trap was checked daily and any trapped birds were removed and humanely disposed of. In 2019 IPCC plan to conduct a nest search earlier in the breeding season (May), if a nest is located we hope to erect a predator control fence to give extra protection to the eggs. With the continued help of Birdwatch Kildare IPCC also plan to erect additional crow traps around the bog. Thanks to funding from the Department of Culture, Heritage and the Gaeltacht under th Curlew Partnership Fund 2018 IPCC were able to employ a contractor to fell these trees, reducing perching sites for predators. IPCC waited until outside of the bird breeding season (March-September). The work was completed on October 23rd, by a team headed by Darren Maguire from Frontline Tree Services. 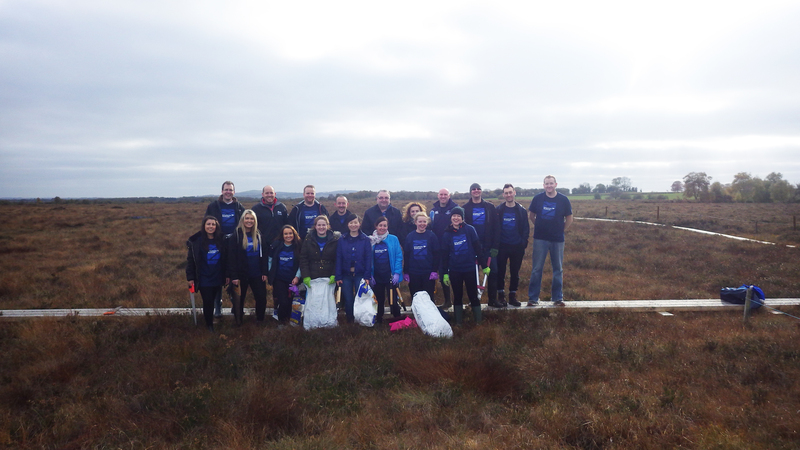 On October 24th IPCC hosted a volunteer scrub removal workcamp on Lodge Bog with 18 volunteers from the Bank of America, Dublin. The volunteers walked Lodge Bog north and removed any scrub or tree saplings observed. Removing trees and scrub helps to prevent the bog from drying out improving the habitat for wildlife and also reduces the number of perching posts for predators in the future. 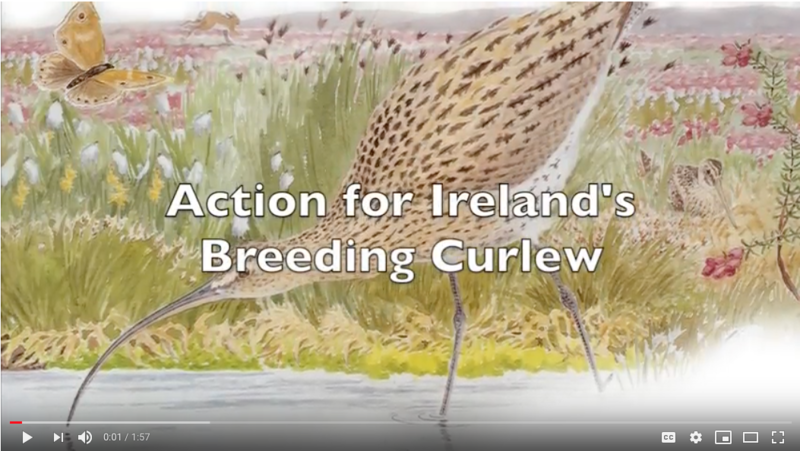 IPCC have produced a short video about our conservation efforts for Curlew. To watch this video follow this link. With 71% of Irish Curlew breeding on peatlands, IPCC believe that both peatland habitat restoration and awareness raising activities are essential to ensure a future for these iconic birds in Ireland. With major backing from Seacology, an international organisation committed to protecting island habitats and assisting local communities in their efforts to protect wildlife, IPCC is confident of making a difference for Curlew. 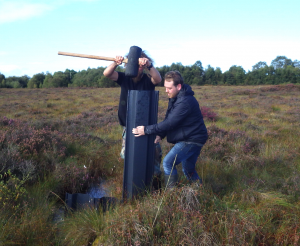 In 2017 IPCC undertook extensive ground surveys of Lodge Bog to determine how wet the bog is and to devise a plan of work on areas which we felt we could make even wetter. 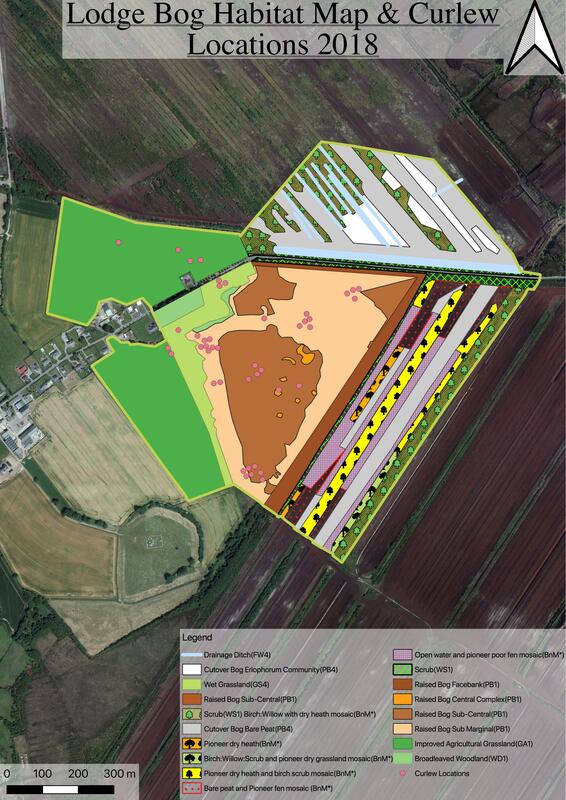 This field work identified that IPCC would need to construct a little over 20 dams in the drains on Lodge Bog with the aim of increasing the wetness of the site. A soft wet bog with bog pools provides ideal foraging areas for Curlew adults and chicks and the wetter the site is the better, as it ensures their ground nest is protected by the inaccessibility into very wet and quaking bogland territory. In late summer and early autumn IPCC began to train volunteers and organise conservation work camps on Lodge Bog. 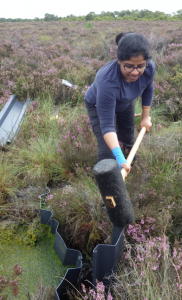 Volunteers were then able to block drains on the bog so as to help increase its wetness. Surveying drains and the effectiveness of dams in blocking them on Lodge Bog. The first steps in drain blocking. Sheets of interlocking plastic lumbar are driven into the bog drain using a mallet. Completing the insertion sheets of plastic lumbar into a drain on Lodge Bog, Co. Kildare Restoring a peat borrow pit on Lodge Bog as the end process in drain blocking. The process of drain blocking involves the construction of a dam across the drain. This is made from two rows of plastic lumbar with a layer of peat sandwiched between them. The dam holds back the water in the drain which allows for the surrounding bogland to rewet. Peat used in blocking the drains is taken from the edge of the drain. The pit remaining after the peat is removed is restored through its inoculation with Sphagnum mosses. The moss fragments are laid on the dam peat and covered with straw which helps to keep them moist until they begin to grow. Within two to three years, the straw melts away and the low hummocks of Sphagnum moss have taken root and begin the process of forming peat again. During the breeding season for the Curlew from April through to July 2017, we worked very closely with BirdWatch Ireland’s local Kildare branch. With the help of expert birders we were able to control grey crow predators of Curlew eggs and their was great joy when one chick fledged the nest and was seen on the bog and in the surrounding farmland. One local farmer even delayed cutting his meadow to allow the Curlew chick to clear the area. The Curlew nest position is marked by a black letter X on the map inset. Four eggs were laid but only one hatched. The map inset also shows a series of blue dots each one representing a sighting of Curlew during the season 2017. As can be seen the birds concentrated on the intact raised dome of Lodge Bog. They also spent time feeding on the agricultural land to the west and north west. We particularly noticed a lot of feeding behaviour when they first arrived. After the chick hatched it was spotted in the surrounding meadows feeding with the parent adult birds. 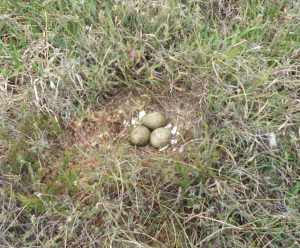 Curlew nest with three eggs on Lodge Bog Spring 2017. The remains of the egg shell that hatched can be seen in the nest. Up to 5 Curlew have been recorded on Lodge Bog so far in 2018. 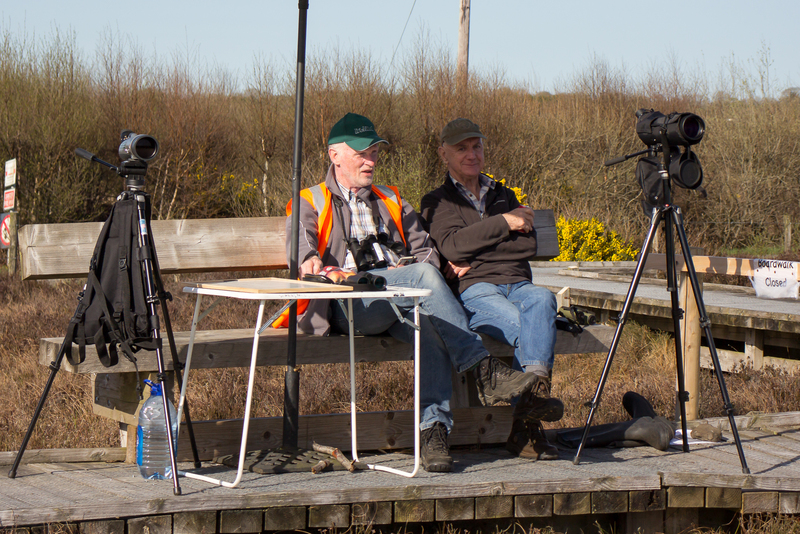 Once again IPCC and volunteers are monitoring the bird behaviour daily. The season got off to a great start with a celebration of World Curlew Day on April 21st at which over 30 participants heard the cry of the Curlew in the Bog of Allen. During the autumn and spring terms of the school academic year 2017/2018, IPCC’s education staff will be meeting with locally based school children to teach them about the ecology of bogs and the unique features of bogs upon which the Curlew depend to complete their life cycle. 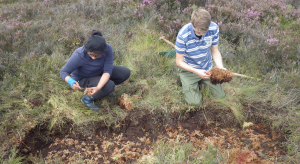 The education programme for schools includes a visit to Lodge Bog during which children explore the living ecology of the bog, including the specially adapted plants living in the bog, how the bog forms peat, the hydrology of the bog and the life of bog pools. The images below show school children walking across Lodge Bog on a boardwalk and demonstrating their love for the Curlew. Lodge Bog is a small remnant of the Bog of Allen – an extensive peatland area that stretches across the Midlands of Ireland but which has largely been lost due to the demands from local communities for a source of fuel to warm their homes and to provide energy for cooking. With the extensive loss of suitable breeding habitat, Ireland has recorded a dramatic decrease in breeding Curlew.